Sales growth is slowing, but market share and profit trends are as strong as ever. 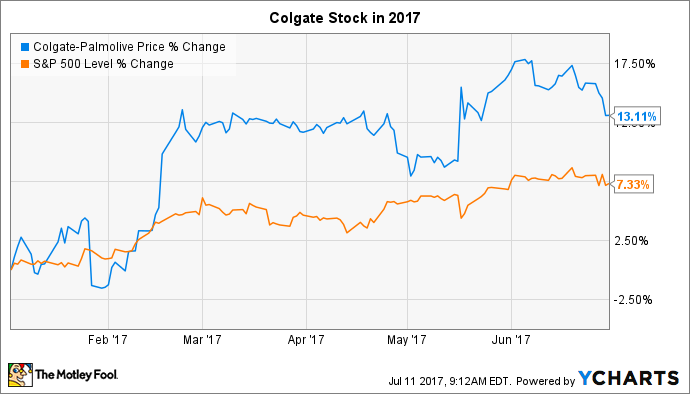 Consumer products giant Colgate-Palmolive (NYSE:CL) beat the market over the first half of 2017, with shares up 13%, according to data provided by S&P Global Market Intelligence. Data through first six months of the year. CL data by YCharts. The rally pushed shares to all-time highs in early June, although the stock has declined slightly since then. Colgate's latest operating results were mixed. Organic sales growth failed to meet management's target due to a sharp slowdown in the core U.S. market. The expansion pace was below 1%, in fact, thanks entirely to gains in emerging markets, where revenue grew by 3%. "Clearly the first quarter was challenging," CEO Ian Cook said in an April press release. The company managed a few impressive wins so far this year, though. Cost cuts and increased prices helped push operating margin to 23.5% of sales in the first quarter, for example. Colgate is a leader in its industry on this metric, with most other global giants struggling to reach even 20% profitability. That's mostly due to the company's dominant position in the global toothpaste industry, where its market share stands at just below 44%. Cook and his team are boosting advertising spending in a bid to spark faster growth through the rest of 2017. Yet they believe a slowing industry will keep a lid on gains this year. Their latest forecast calls for organic sales growth to come in below their target range of between 4% and 7%. That projection implies a roughly steady market share position. But, along with improving profitability and higher cash flow, that's a solid overall performance for the industry leader. Look for potential updates to those full-year forecasts when Colgate-Palmolive posts its fiscal second-quarter results on July 21.